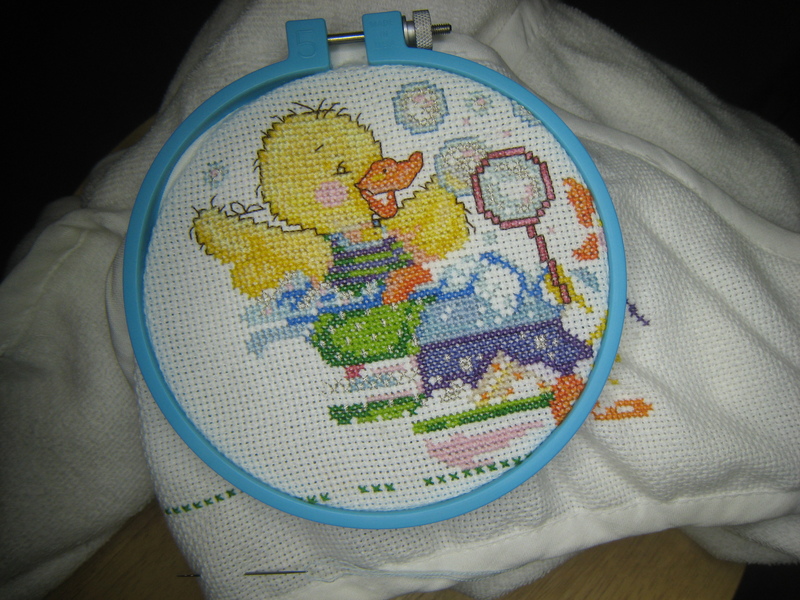 Cross Stitch Progress: We Have a Ducky! There’s only a week to go until my art retreat, which coincides with my deadline for the cross stitch project as well as a lot of work-at-work to get ready for being away. 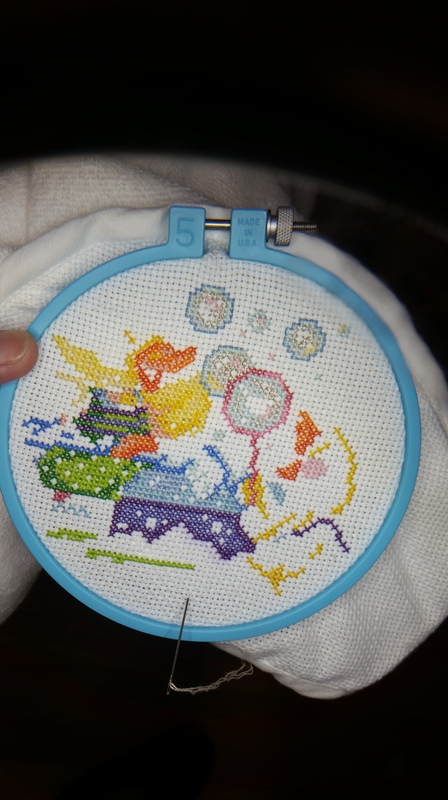 So I’m already tired and ready for some shut eye but got some good progress in this weekend on the cross stitch. I’m regretting my choice to bust my thread stash for this because I didn’t have enough of some key colors, which slowed things down. Plus I didn’t always guess right (proven by a run to the thread store for extras – I forced myself to compare each thread color to see how far off I was). There are only a handful of colors that don’t match the pattern palette, but I think my choices will work out. We’ll spend just one sentence talking about how much stitching and unstitching I did on Sunday. (That was it.) I learned not to work too far ahead with a color just because it’s on the needle. I can only count so far on blank aida cloth apparently. But a fuzzy ducky head feels like progress indeed. Maybe I’ll get up early and do tonight’s stitching in the morning (…prolly not…). It’s a slow crafting week here as I get ready for some time off from work (that always requires prep, planning and the dreaded IT documentation). I can see some shapes forming, but I’m questioning some of my “in-stash” color choices and I’m also out of some of the main colors I randomly assigned. I probably should have bought the yellow’s, at the very least – there’s a lot of that color. But I still have faith that the outline stitches will bring it together (plus a trip to the store for more thread!). WIP for sure! 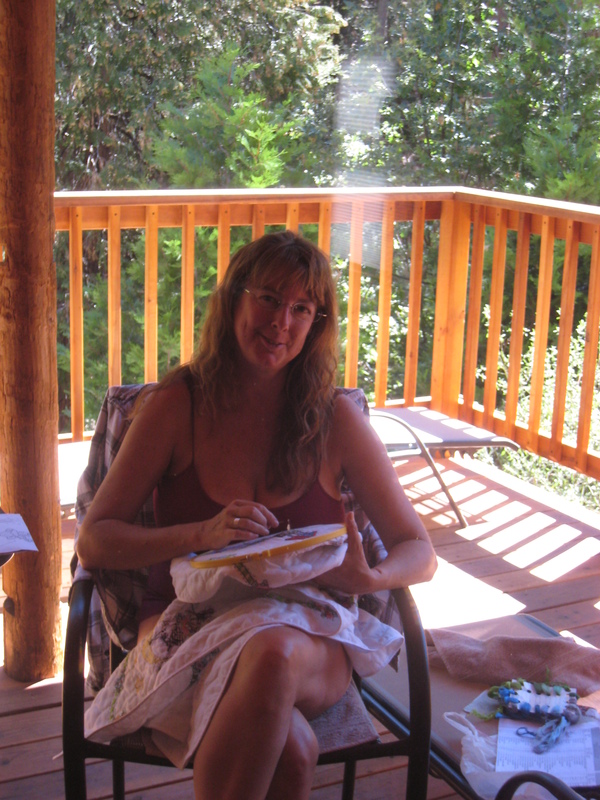 It’s really hard for me to continue on free form patterns not knowing what the outcome will be – I get kind of hung up on the intended end result and whether this path will actually get me there. I think that’s a first hurdle to overcome – probably best achieved with lots of experimentation. 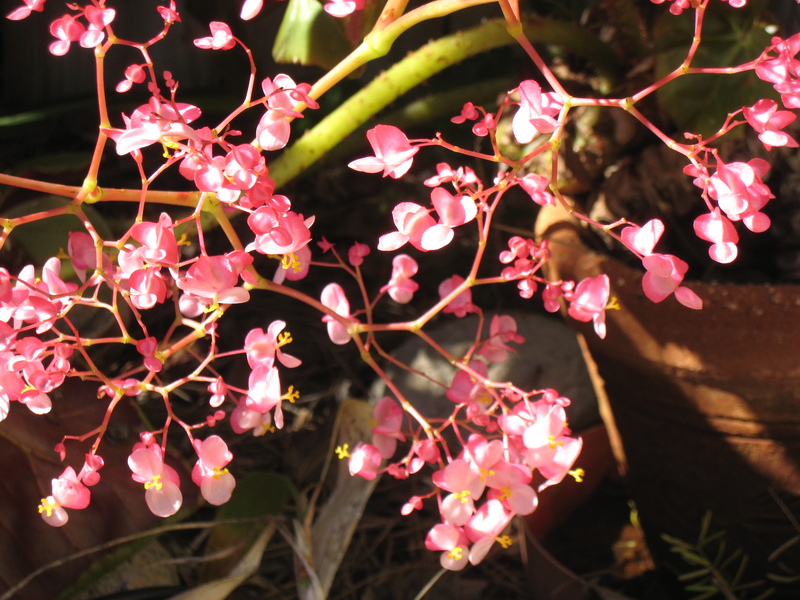 Anywho’s, the light was striking and I was happy to catch all those little yellow stamen/pistil guys perched among the pink butterflies. Today I got a fun treat in the mail from my bestie! 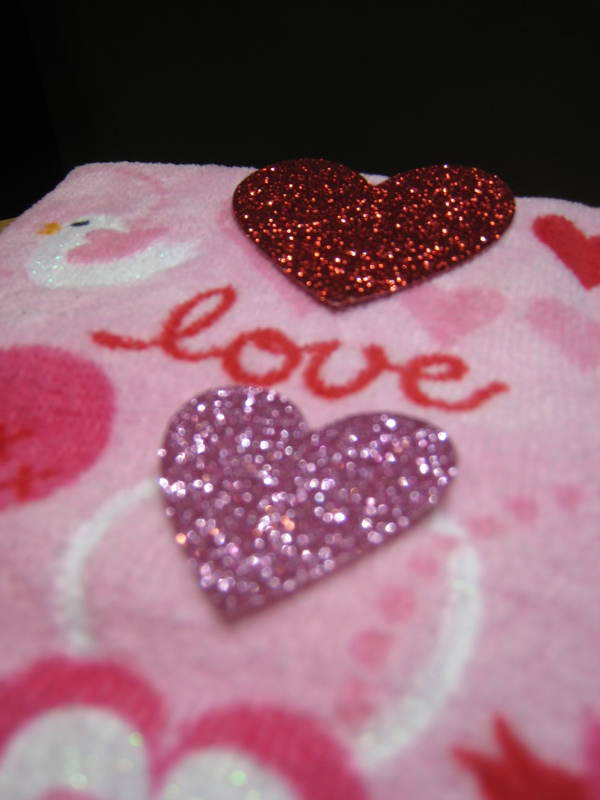 Dish towel, glitter stickers and LOTS O’ LOVE!! God bless the postal service, for it brings us all the mistakes we make on amazon with a bottle of wine, all the impetuous ebay purchases (only do “Buy It Now,” the rest is way too stressful – tho I do know a Ninja Expert in this space), and (most importantly!!) FRIEND LOVE. Keep sending those snail mails, friends. Nothing beats a hand-addressed envelope from a friend in the mailbox to brighten things up. (amiright? canigetanamen?) P.S. To all my friends and family reading this, I promise to do better on this front. Ahem and amen. And Now for the Cross Stitch!!! This part actually includes love and light too, so it all works out! 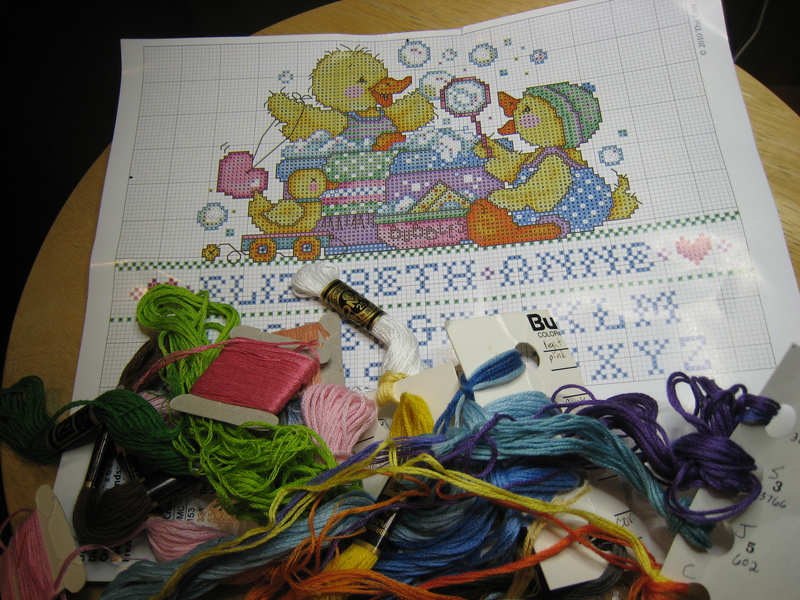 I’ve just started working on a present for a friend with a new baby and boy, have I messed this up in the past (remember the Mother Goose cross stitch blanket I started 100 years ago? That child is starting kindergarten in August and the blanket is *maybe* halfway done. It was clearly destined for an entirely different child. Maybe I’m involved in some time travel here…stories needle workers tell themselves…). In fact, I found that same pattern at the store this time around, for $45. Did I actually pay that and expect to get done in this century?! I noticed the other (simpler) patterns nearby were half the price. Ah youth (Or “yute,” depending on where you’re from – it’s about 1:20 in – such a fave.). So I went to one store that had great patterns and no supplies – so I bought a pattern book for bibs, expecting to buy some bibs at the next store. Then I went to the next store, that had great supplies and so-so patterns – so I bought a blank cross-stitch hooded towel and a monkey. Let me explain. So there’s THIS cute monkey guy, who’s actually going to sport the baby’s name on his bib without actually BEING a bib…get it? I don’t either, but I couldn’t imagine myself using a hand cross-stitched bib to feed my baby all the dribble that ends up spilling right back out. It’s a nice idea, but would they really use it? Would it turn into a hand-washing nightmare that never sees the light of day? I remember the drudgery and confusion that was high chair mealtime and I can’t imagine bringing a hand-stitched item into the mix. The other stuffed animal was a peacock, so clearly I made the best choice for the audience. Then there’s the hooded baby towel. No picture of that yet because it’s all white and lacking stitching and a cute baby. But here’s the fun part so far: I decided to forage for the embroidery thread colors in my stash instead of buying “all materials needed.” So I may run out of some colors (and it kind of exhausted me to find the equivalents of everything that might/hopefully go together in my meager stash; then I got distracted by netflix again, this time: “Slow Learners.” I tried to work through it but the facial expressions needed tending to…so I lost another 1.5 hours). But here’s what’s happening tomorrow! A little scrub-a-dub yellow duckie theme for the hood – should be cute! I also purchased some white terry cloth to sew into the hood, to cover up my ends and protect his precious little head. At the cutting table I had the brilliant idea to use the extra for a matching wash cloth. How cute can I make that?!?!?! First things first. 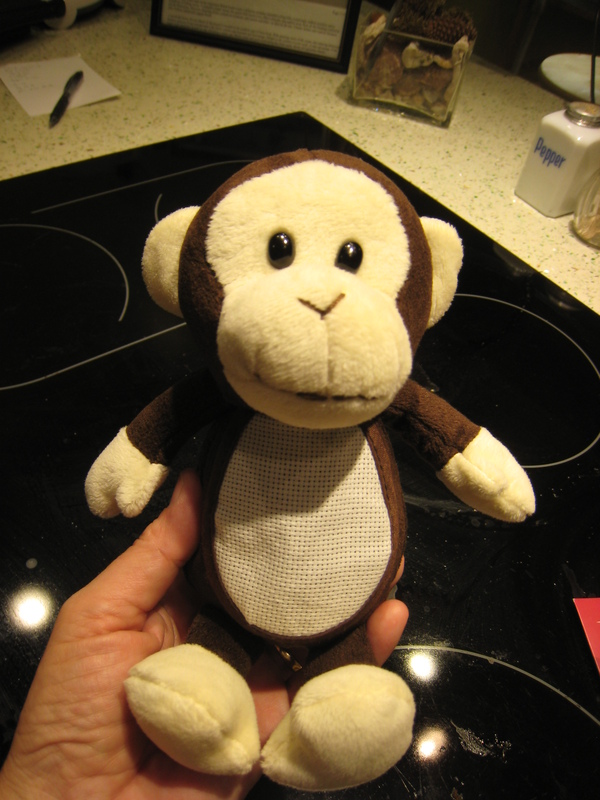 And if the towel doesn’t work out (for this particular blessed small being), I always have the monkey…and the promise of more small beings down the road. Did I mention I have two weeks to complete? I CAN DO THIS (I’m so bad at estimating projects!! ).